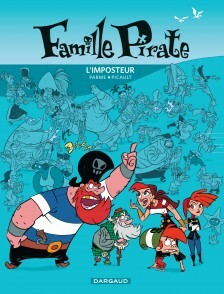 This is the comic book adaptation of the hit animated series. 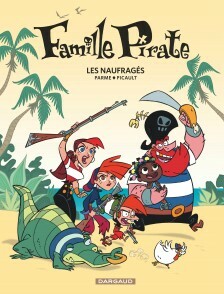 A cartoon broadcast in France since 1999, with 798,000 viewers, La Famille Pirate has 31,000 fans on Facebook. Victor Mac Bernik’s ship, the Os-à-Moelle, has been banned from sailing! Poor Victor is reduced to becoming a ship-wrecker, an infamous and forbidden act among the pirates of Tortuga. One night, he takes a galleon down. Bad luck: the ship’s hold turns out to be filled with black slaves. Worse: next day, when Victor goes to look for them, the slaves have disappeared! His sworn enemy, Irving the Shark, has stolen the precious merchandise, imprisoned the slaves and is using them to get rich by selling their services to the wealthy people of the island. This terrible injustice infuriates Scampi, Bigorneau and their mother Lucille. The Pirate Family can’t just sit by! To arms – the time has come to take action!… A new entry in the comics series that makes it fun to think! La Famille Pirate, by Aude Picault and Fabrice Parme, takes on important questions of civic engagement and solidarity in society: liberty, equality, fraternity! And always with humor, finesse, and a deft, light-hearted touch!